As the assault on union standards continues—wherever we still have them—glimmers of hope in 2015 came from grassroots resistance. Employers who wrung temporary concessions during the financial crisis are doing their best to make the cuts permanent. Companies are coming after us in auto plants, on the docks, in hospitals—anywhere members make a solid wage, retire with pensions, or have health care paid for by their employers. It’s six years since economists declared an end to the Great Recession. Corporate profits and state budgets have largely bounced back. Employers like Kohler are pushing concessions not because they need them, but because they can. They sense labor’s weakness; these union standards were generally established decades ago. Now union members are down to 11 percent of the workforce, and often divided into tiers, with recent hires making less—a recipe for shrinking power. Chrysler workers inspired us with their bottom-up backlash against a contract that would have made the two-tier system permanent. They got no help from union top brass, who had recommended a yes vote. But organizing with homemade flyers and Facebook groups, rank and filers voted down the tentative agreement, 2 to 1, forcing the higher-ups to go back and do better. Carhaulers too voted down a bad deal—handed down by a bargaining committee of yes-men, handpicked to exclude challengers to the union’s entrenched international officers. These truckers who transport new cars to dealerships have the advantage of an ongoing organization, Teamsters for a Democratic Union, to help them turn a surge of anger into a sustained campaign. Teachers have become a hub of militancy, spurred on through a growing national network. The Chicago Teachers (CTU) and their community allies, who touched off this wave with their 2012 strike, continue to inspire. In September, activists’ four-week hunger strike to save Dyett High School ended in a partial victory. In December, the teachers swept another strike vote—with 88 percent of the full membership voting yes—while hundreds of high-school students sat in for the reopening of their school library and rehiring of their librarian. Members of the nation’s second-largest teachers local, United Teachers Los Angeles, last year elected reformers cut from the same cloth as CTU. This year the new leaders drew fresh rank-and-file energy into a contract campaign that culminated in a 15,000-person rally and won the local’s first-ever language on class size. Half the teacher locals in Washington state joined rolling strikes over class size and pay. The idea started in a small school district near the Canadian border and snowballed. Seattle teachers springboarded from there to a five-day strike that won guaranteed recess for all elementary school students. In Jefferson County, Colorado—where last year students walked out of schools against a plan to censor the U.S. history curriculum—teachers and their allies ousted the school board’s conservative majority in a recall election. The same reformers who’d organized a 2012 work-to-rule campaign wrested leadership of Hawaii’s statewide teachers’ union, after a vigorous fight to get the ballots counted. Others are gearing up to run and change their unions in Philadelphia, Massachusetts, and more. The starkest attacks are in labor’s traditional industrial strongholds.Steelworkers are locked out at Allegheny Technologies—health care cost increases are the biggest sticking point—and deadlocked at the big steelmakers. Earlier this year, a national strike in oil refineries won a pact the Steelworkers hoped would salve unsafe staffing. Telecom workers at Verizon are battling stalled negotiations with spirited local actions. A four-month winter strike at FairPoint, Verizon’s successor in New England, wrapped up in February, when workers won limits on subcontracting and beat back two-tier wages, but gave up pensions and retiree health care for future hires. Pensions are a prime target. After the Central States Pension Fund announced plans to slash payouts, current and retired Teamsters turned out to protest by the hundreds in city after city across the Midwest. 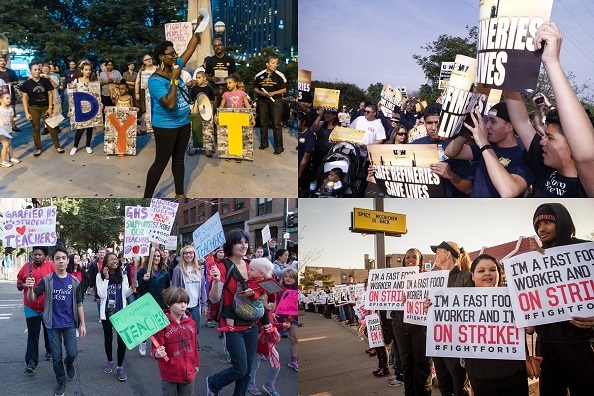 Grassroots mobilization, fueled by outrage, wasn’t confined to the labor movement this year. As police continued to kill unarmed African Americans and evade prosecution, protesters filled the streets of major cities to insist that Black Lives Matter. Resolutions and press releases notwithstanding, unions have struggled to find their place in that movement. But a few locals have begun to point the way. AFSCME 3299, representing campus workers in the University of California system, is starting with conversations, getting members talking to one another about their own experiences with policing and discrimination. After nine African American churchgoers were killed in Charleston, South Carolina, Longshore (ILA) Local 1422 organized a march and strategy conference, trying to channel outrage into policy change. The local had long fought to take down the Confederate flag from South Carolina’s Capitol building, a goal that was finally realized this year. Besides mobilizing around the problem of police violence, several groups are highlighting and tackling the Black jobs crisis, including UNITE HERE in Miami, United Workers in Baltimore, and the L.A. Black Workers Center. The Fight for $15 continues to gain momentum, in fast food and beyond. New York fast-food workers scored a statewide $15 minimum wage for the industry. Los Angeles joined Seattle and San Francisco in phasing in $15 citywide. Workers seeking $15 through union drives or contract campaigns included berry pickers in Washington, UPS package delivery drivers in New York, and hazardous waste temps in Portland. Electoral politics remained a mostly bleak landscape for labor this year, and as we gear up for another presidential election, it’s safe to assume unions will put more in than they get out of it. And the union-backed coalition that sought to unseat Chicago Mayor Rahm Emanuel lost in the spring, though it did elect one of its city council candidates, teacher Susan Sadlowski Garza. One bright spot in December was the glad tidings that Congress had agreed to delay for two more years the so-called "Cadillac tax," previously slated to kick in 2018, which has plagued unions’ health care bargaining. Could the tax be on its way out for good? Wisconsin, the birthplace of public sector unions, became the 25th state to pass a so-called “right-to-work” law banning union shops—though Kentucky, the last Southern holdout, once again staved off such a law. Public sector unions remain on the defensive, facing down state legislative attacks and waiting for the other shoe to drop in Friedrichs v. California Teachers Association. The Supreme Court decision, expected as soon as next spring, could ban fair-share fees in the public sector nationwide. In the best cases, unions are taking the urgency of the threats as a motivator—not just to sign up new members, but more importantly, to make members feel the union is theirs, by training more rank-and-file leaders and helping them take on workplace fights. And public sector workers in Quebec ended the year on a high note, showing the rest of us what a general strike by 400,000 people looks like. > The article above is a shortened version of the one written by Alexandra Bradbury for Labor Notes.